The PBR and the World Champions Rodeo Alliance (WCRA) have teamed up for a weekend of Western sports action in Green Bay, Wisconsin, on May 31-June 2. Between the two days of competition at the Green Bay Invitational, the WCRA will hold its second major of 2019 with the Titletown Stampede. For more WCRA content, visit wcrarodeo.com. Corey Bailey is the 2018 International Professional Rodeo Association bull riding champ, and he’s now taken that title three years in a row. The big-time bonus of this most recent IPRA buckle is his bye into the World Champions Rodeo Alliance’s $1 Million Titletown Stampede, coming up June 1 in Green Bay, Wisconsin. Bailey, 27, lives in Buchanan, Tennessee, with his wife, Krista. Kendra Santos: Did I hear right that you just tied an IPRA record with that third-straight championship, and that that matches fellow Volunteer State bull rider Dennis Morris’ now 25-year-old mark from 1992-94? How proud are you of your hat trick, and do you know Dennis? Corey Bailey: I’m super proud. I couldn’t be happier. Just to be able to do it three years in a row is pretty cool. That’s about as good as it gets. I’ve known Dennis since I was in ninth grade. He brought the bulls to most of our high school rodeos, and has helped a lot of kids in Tennessee with their bull riding. Dennis is friends with my best friend’s (bullfighter Jon Roberts is Bailey’s best buddy) dad, Ernie Roberts. Ernie has put on a lot of bull riding schools, and brought in Dennis several times to be the instructor. KS: Before his bull riding trifecta, Dennis Morris won his first IPRA championship in 1990, for four total. Do you have your sights set on breaking that record with a consecutive four peat this year? CB: Oh yeah. Honestly, this is the first time I’d heard I’m the only one who’s tied Dennis’ threepeat. Getting to four this year would be great, and winning it four times in a row would be a pretty big notch in the belt. KS: About that bye into Green Bay…How does a shot at winning $50,000 in one night grab you? CB: It probably grabs my wife a lot more than it grabs me. We could do a lot with $50,000. Just getting to be there to try and ride for that much money is an awesome opportunity. My wife is a speech pathologist, and she really wants to start her own clinic up in Paris, Tennessee, where I grew up. If I won $50,000, I know that’s where it would go. KS: How’d you first find out about the IPRA’s new alliance with the WCRA, and what are your early observations about the WCRA and what it’s doing for contestants? CB: I first found out about it from the IPRA website and Facebook page. They tagged me in something that showed how the two were coming together. I think it’s awesome for IPRA contestants, and a great opportunity for all cowboys and cowgirls that the WCRA is adding more money to be able to win and make better careers out of rodeoing. More money just makes the sport better for everybody, and I like how they’re giving everyone a shot at it. KS: Why do you choose to ride in the IPRA, and why does it suit your 5’ 6”, 120-pound self so well? CB: When I first turned 18, I hit the PBR (Professional Bull Riders) events for a few years, then rode a few years at CBR (Championship Bull Riding) events. I like that most of the IPRA rodeos are on the East Coast, so it’s not nearly as far for me to travel. We have a lot of rodeos in North and South Carolina, Georgia, Indiana, Ohio and Illinois, so you can go to 100-150 rodeos without so much driving. Being from Tennessee makes it make sense for me. I enjoy the rodeos, but not driving super far. I’m tired of traveling. KS: Which bull rider do you look up to most, and why? CB: That’s a question I’ve never been asked. I’d probably have to say J.W. Hart, just because of how tough he was. He had the record in the PBR for riding at the most events in a row without missing one, and earned the nickname of Ironman of the PBR. I also look up to Lane Frost. I think he’s everybody’s favorite. 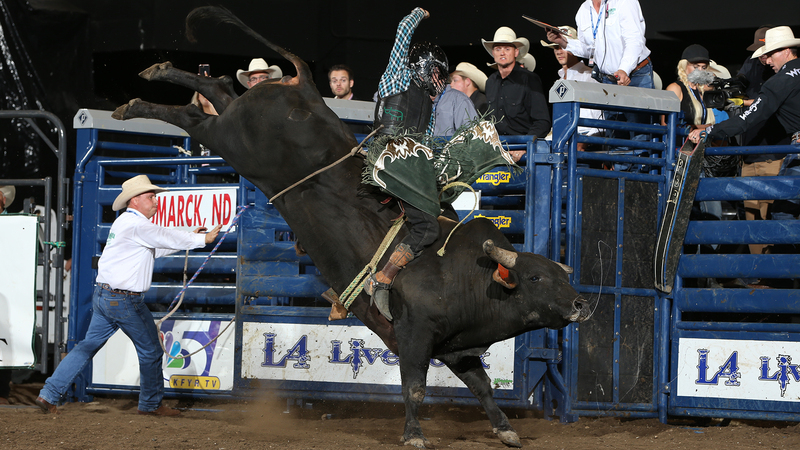 He’s just an icon in the sport of bull riding. If you know bull riding, you know Lane Frost. We’ll always wonder what would have been, like whether or not he’d have broken Donnie Gay’s record (of eight world bull riding titles in the Professional Rodeo Cowboys Association). KS: What’s your ultimate goal as a bull rider? 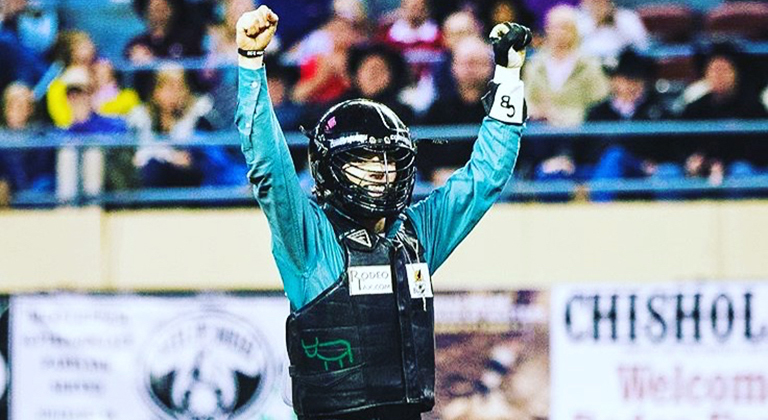 CB: My ultimate goal is to be the best bull rider I can be—to just go out there and try hard every time, enjoy it and have fun doing it. KS: What are you looking forward to most about riding at the Titletown Stampede? CB: I’ve never been to Green Bay, Wisconsin, so that’s one thing. And being able to compete for that amount of money. Just being able to ride against some of the best bull riders on some of the best bulls will be something special. The main thing is I want to do good. I want to show people that just because I ride in the IPRA doesn’t mean I’m any less of a bull rider than the rest.